From Mamoru Hosoda, the visionary director of "The Girl Who Leapt Through Time", comes a brand new, award winning animated feature, Summer Wars, the story of an ordinary family forced to go to extraordinary lengths to avert an impending cyber-apocalypse. Described by Jonathan Clements (author of "Schoolgirl Milky Crisis: Adventures In The Anime And Manga Trade") as "Ghost In The Shell for the Facebook generation", as a "contemporary romance for the Facebook generation... [that] rivals the work of Ghibli" (Tom Smith, Neo) and by Anime News Network as "a triumph… incredibly entertaining and intriguingly intelligent… pretty much perfect", Summer Wars was the winner of the 2010 Japan Academy Prize for Animation of the Year, the 2010 Japan Media Arts Festival's Animation Division Grand Prize, the Anaheim International Film Festival's Audience Award for Best Animated Feature and was nominated for the prestigious Golden Leopard award at the Locarno International Film Festival. "A near-perfect blend of social satire and science-fiction" (Anime News Network), "richly detailed and beautifully written" (Twitch), Summer Wars is "a superb example of Japanese anime… with an appeal beyond Japanese animation buffs" (The Los Angeles Times). Summer Wars (cert. tbc) will be released on DVD (£17.99) and Blu-ray (£19.99) by Manga Entertainment on 28th March 2011. Special Features include: interview with director at Locarno (13 mins); stage greeting (20 mins); cast interview (25 mins); trailer (4 mins); teaser trailers; TV spots. 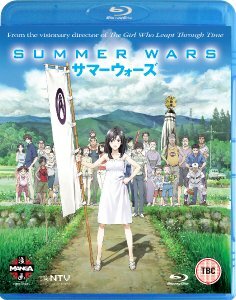 On the same day, a Mamoru Hosoda twin-pack containing Summer Wars and The Girl Who Leapt Through Time priced at £29.99 will also be released. This will be the only way to get The Girl Who Leapt Through Time on Blu-ray in the UK.